Prince Félix of Bourbon-Parma (Félix Marie Vincent; 28 September 1893 – 8 April 1970), later Prince Félix of Luxembourg, was the husband of Charlotte, Grand Duchess of Luxembourg and the father of her six children, including her successor: Grand Duke Jean. He was the longest serving consort of Luxembourg. He was also the younger brother (by sixteen months) of Empress Zita of Austria. Of the twelve children of Duke Robert's first marriage to Maria-Pia of the Two Sicilies, three died as infants, six had learning difficulties, and only three married. Despite loss of his throne, Duke Robert and his family enjoyed considerable wealth, traveling in a private train of more than a dozen cars among his castles at Schwarzau am Steinfeld near Vienna, Villa Pianore in northwest Italy, and the magnificent Château de Chambord in France. Less than four months after Robert's death in 1907 the Grand Marshal of the Austrian Court declared six of the children of his first marriage legally incompetent, at the behest of Duchess Maria Antonia. Nonetheless, Robert's primary heir was Elias, Duke of Parma, (1880–1959), the youngest son of the first marriage and the only one to father children of his own. Duke Elias also became the legal guardian of his six elder siblings. Although Félix's elder brothers, Prince Sixte and Prince Xavier, eventually sued their half-brother Duke Elias to obtain a greater share of the ducal fortune, they lost in the French courts, leaving Prince Félix with modest prospects. Félix served in the Austrian Dragoons as Lieutenant and Captain, but resigned his commission in November 1918. On 6 November 1919 in Luxembourg, the prince married his first cousin Grand Duchess Charlotte of Luxembourg, having been admitted to the nobility of Luxembourg and also made Prince of Luxembourg by Grand Ducal decree the day before. Unlike some European consorts, Félix neither adopted his wife's dynastic surname (of Nassau), nor relinquished his own title and name "Prince of Bourbon-Parma". His traditional style as a Bourbon prince of the Parmesan branch is the reason that cadet members of the Grand Ducal Family of Luxembourg enjoy the style of Royal Highness (but that style belongs to the Luxembourg monarch and heir apparent by right, as the historical prerogative of grand ducal dynasties). Felix was president of the Luxembourg Red Cross between 1923 and 1932 and again between 1947 and 1969. 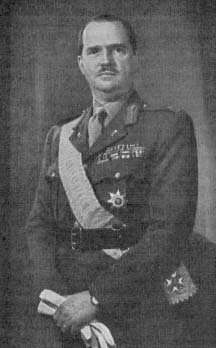 He was also Colonel of the Luxembourg Volunteers Company since 1920 and Inspector-General of the Luxembourg Army between 1945 and 1967. Urban legend has it that Félix lost the Grünewald, a forest owned by the Grand Duchess, at a casino in 1934, but this is false; part of the property was sold, along with Berg Castle, to the Luxembourgian government, with the revenue paying for the upkeep of the grand-ducal household, and was not spent on personal consumption, let alone gambling losses. Prince Félix died at Fischbach Castle on April 8, 1970. His funeral mass was held at the Cathedral of Notre-Dame and he was later buried in the Royal Crypt. Jean, Grand Duke of Luxembourg (born 1921), who married HRH Princess Joséphine-Charlotte of Belgium (1927–2005). Has issue. Princess Elizabeth of Luxembourg (1922–2011), who married HSH Franz, Duke of Hohenberg (1927–1977). Had issue. Princess Marie Adelaide of Luxembourg (1924–2007), who married Karl Josef Graf Henckel von Donnersmarck (1928–2008). Had issue. Princess Marie Gabriele of Luxembourg (born 1925), who married Knud Johan, Count of Holstein-Ledreborg (1919–2001). Has issue. Prince Charles of Luxembourg (1927–1977), who married Joan Douglas Dillon (born 1935), the former wife of James Brady Moseley. Had issue. Princess Alix of Luxembourg (1929–2019), who married Antoine, 13th Prince of Ligne (1925–2005). Had issue. Felix's patriline is the line from which he is descended father to son. Patrilineal descent is the principle behind membership in royal houses, as it can be traced back through the generations - which means that if Prince Felix were to choose an historically accurate house name it would be Robertian, as all his male-line ancestors have been of that house. Felix is a member of the House of Bourbon-Parma, a sub-branch of the House of Bourbon-Spain, itself originally a branch of the House of Bourbon, and thus of the Capetian dynasty and of the Robertians. Felix's patriline is the line from which he is descended father to son. It follows the Dukes of Parma as well as the Kings of Spain, France, and Navarre. The line can be traced back more than 1,200 years from Robert of Hesbaye to the present day, through Kings of France & Navarre, Spain and Two-Sicilies, Dukes of Parma and Grand-Dukes of Luxembourg, Princes of Orléans and Emperors of Brazil. It is one of the oldest in Europe. Wikimedia Commons has media related to Prince Felix of Bourbon-Parma. ^ per Arrêté grand-ducal du 5 novembre 1919. (Published in Mémorial A n° 74 de 1919). ^ Juncker, Jean-Claude (15 February 2007). "Réponse à la question parlementaire no.1220 du 4 août 2006 de Messieurs les Députés Gast Gibéryen et Roby Mehlen" (PDF) (in French). Investigateur. Archived from the original (PDF) on 27 September 2007. Retrieved 28 June 2007. ^ "Grand Duchess Charlotte of Luxemburg". forum.alexanderpalace.org. Retrieved 21 December 2015.